With more than 300 recipes covering pork, lamb, beef, poultry, game, and offal, The Meat Cookbook is loaded with authentic international recipes such as Feijoada (Brazilian stew), Frango Piri Piri (Portuguese spicy chicken), Andalucian Tripe, and much more. 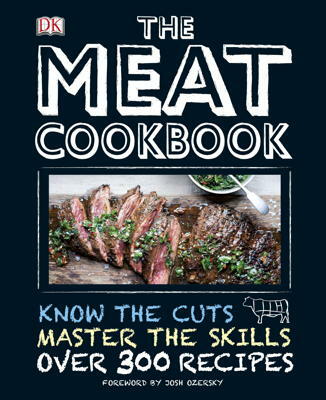 50 step-by-step techniques on how to properly cook meat, expert advice from butchers on meats that can be butchered at home, and tips on flavor pairings make The Meat Cookbook more than a cookbook — it’s a meat lover’s bible. When it comes to coming meat, I typically stick to the cuts I know. I can make a mean barbecued steak, roasted chicken, baked chicken breasts and a juicy sweet ham. In the meat section of the grocery store, I normally don’t deviate into the “unknown”. For example, I’ve never cooked lamb or veal and I’ve never eaten game meats. Because I’m ready to step out of my cooking comfort zone, I wanted to pick up a copy of The Meat Cookbook. It’s the next best thing to having someone physically show you how to prepare certain types of meat. I fact, I think this cookbook might be even better than having a relative show me the ropes. I know my mom is in the same boat as me! The Meat Cookbook is like the bible of meat and meat recipes. Not only do you learn about the various cuts of meat, but you’ll also learn how to prepare them. It’s loaded with mouthwatering recipes and full colour photos too so you can see what the dish is supposed to look like. In Meat Know-How, you’ll get tips from the butcher about choosing the best meat and also learn about the variety of cuts. There’s even a section on knives and other cooking equipment. They mention that a meat thermometer is a must. I agree! I always want to make sure my meat is fully cooked before I serve to my family. There’s nothing worse than thinking it’s cooked and biting into raw meat! Different ways to prepare meat is also discussed. Some of the methods I was familiar with like sauteing and barbecuing. I’d never heard of a Tandoor Oven before though! I also appreciated the step by step instructions with pictures on how to carve poultry and other types of meat. There is a method to the madness and they make it look so easy! I’m going to have to pull out this cookbook next time I’m carving up a bird. My kids laughed at me the last time I tried. I thought it turned out ok though. The detailed cooking charts were very helpful. They showed how to cook just about every kind of meat you can think of in a variety of ways. I was surprised to see Horse and Kangaroo listed. I’m pretty sure I won’t be trying either one anytime soon, but now I know that you are supposed to cook them like venison. I didn’t even realize people ate horse or kangaroo!!! Did you? The other chapters are all about the different kinds of meat! In Poultry, you’ll learn about the various cuts and how to debone and butterfly a bird. In Pork, they discuss pork cuts, bacon and ham and also how to prepare a suckling pig. Now that is something out of my comfort zone! However, it’s good info to know. Other chapters include Beef and Veal, Lamb and Goat, Game, Offal and Home Butchery. My favourite part of the book is all the recipes! At the end of each section, you’ll find loads of yummy meat recipes to try. I’ve bookmarked a bunch including Chicken Adobo, Goose Pot Pie, Boiled Beef Brisket with Herb Dumplings and Greek Lamb Stew. The only chapter I’m not sure about is the section on Offal…organ meat. If you’ve ever wanted to learn how to make blood sausage, this is your book. For more gift giving ideas, check out DK Canada’s Gift Boutique! Connect with DK Canada on Facebook & Twitter. This is THE book for me! I’m such a carnivore I think I would love this book! Yay for meat!! Looks like a good cookbook, might help me switch up the way I cook meat instead of sticking to the same ways all the time. This book would be very convenient. Often unsure how to cook meats. My hubby is a huge carnivore whereas I have never been much of a meat eater and not very comfortable in cooking it either. This book would probably be of good use to me. That looks like a great reference book to have in my cookbook library! I’m going to have to go look at it! I like having that it has techniques and tips which would be useful for me! I like a lot of cookbooks, but I do not think that I have one on Just meat like this one. I like that is has step by step instructions. I would like to take a look at this book to see the recipes. It sounds great! Great review! It looks like this is my type of book – I love to eat meat but get bored to making always the same recipes and, of course, I know next to nothing about carving! The Meat Cookbook is a must have for people who want to cook meat. The book teaches the various cuts of meat, and how to prepare them, I think it would make a great gift. Thank you for sharing this review.